I love Pistachio Pudding as a Christmas color this year, and I decided to try pairing it with Pink Pirouette for a subtle Christmas card. I loved the outcome! With the silver the two colors make such a lovely card. What do you think? 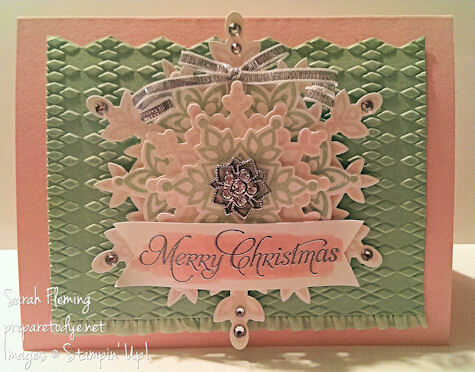 I embossed the Pistachio Pudding cardstock with the Argyle folder; I love this folder for Christmas cards, because both Christmas and argyle make me think of sweaters and socks. And if I’d written “My Favorite Things”, soft, warm sweaters and toasty, fuzzy socks would have made the cut. The Ruffle Stretch Trim ribbon at the bottom is yummy, right? 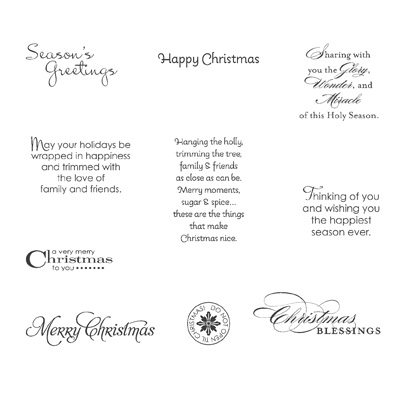 I love that it can be used for elegant, homey, cutesy, or grungy cards — you can use it for anything. Such a beautiful ribbon, and it comes in all of the new 2013-2015 In Colors. 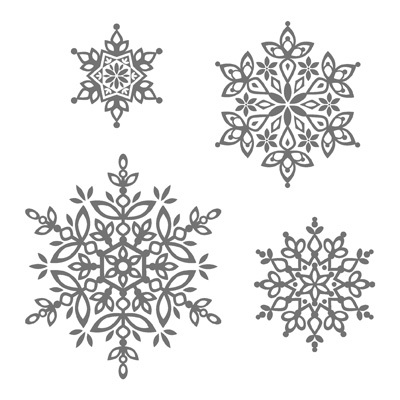 The layered snowflakes are from the Festive Flurry stamp set and matching framelits. My favorite stamps are those that have either a matching punch or a matching set of framelits. The Festive Flurry stamps and framelits can even be bundled for 15% off! It’s a pretty sweet deal. That beautiful piece in the center is one of the Frosted Finishes. I haven’t tried this yet, but I’ve seen other people embossing them in gold, so if gold is your Christmas accent of choice (in case you can’t tell, I’m partial to silver), these doo-dads would still work for you. 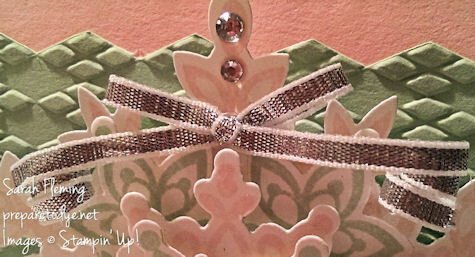 The silver ribbon gave me fits when I made this card last night! It’s easy to work with, but I had a kink in my ribbon, because I’d been playing with it earlier for another card. The kink was still a little noticeable after I had the ribbon glue-dotted onto the card, so I started trying to fix it. And that ended with the left side in that adorable little curl. But then it took a lot of convincing with the edge of my scissors to get the right side to curl the same way. Two tips for curling this ribbon: 1) Use an outside edge of your scissors and not a blade. When I’ve tried curling it with a blade, the ribbon has frayed too much at the ends. 2) Cut the ribbon a little longer than you need it. Even using the outside edge of the scissors, it will fray a little, and you can just snip off the fray. 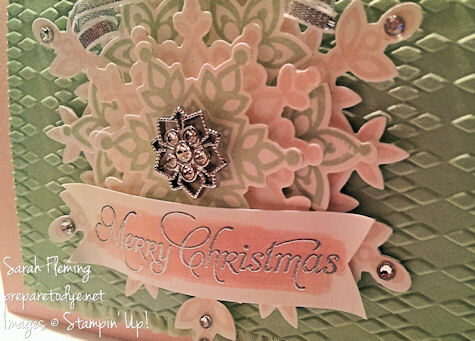 After I embossed “Merry Christmas” in Silver, I just colored around the sentiment with the brush end of my Pink Pirouette marker and then snipped it out and flagged the ends with scissors. I hope you like the card. This is one of my favorites that I’ve made this year. You can buy all of the products I used in my Stampin’ Up! online store , 24/7. What an amazing sale! Stampin’ Up! 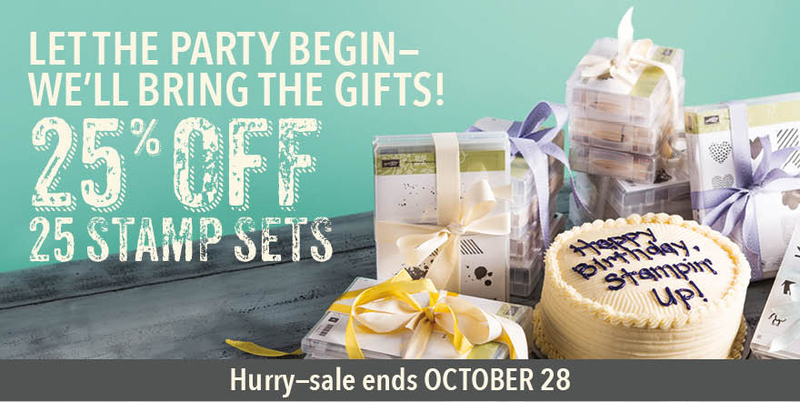 has 25 stamp sets on sale for 25% off, in keeping with their 25th anniversary theme! Some of my favorite sets are in there, including Zoo Babies, Snowflake Soiree, A Dozen Thoughts, Cuddles & Kisses, Gorgeous Grunge, Hearts a Flutter, Itty Bitty Banners, and Ornament Keepsakes! Okay, can you tell I have a lot of favorites? The sale only goes through Monday, so make sure you pick up your favorites. See the full selection here, and don’t forget to select me (Sarah Fleming) as your demonstrator.